Youth-and-age (Zinnia elegans): growing, planting, caring. A very popular species with many cultivars to choose from. Zinnia elegans - youth-and-age or simply zinnia - is an annual flowering plant of the genus Zinnia, native to Mexico and grown as an ornamental. The type species grows to about 30 in (76 cm) in height, with solitary flower heads about 2 inches (5 cm) across, with purple ray florets surrounding black and yellow discs, and lanceolate leaves opposite the flower heads. Zinnias are popular garden plants with hundreds of cultivars in many flower colours, sizes and forms, including 'Magellan', 'Envy Double', 'Fireworks', 'Purple Prince', 'Blue Point Purple', 'Profusion Cherry', 'Star Gold', 'Crystal White', and even mixed-colour. 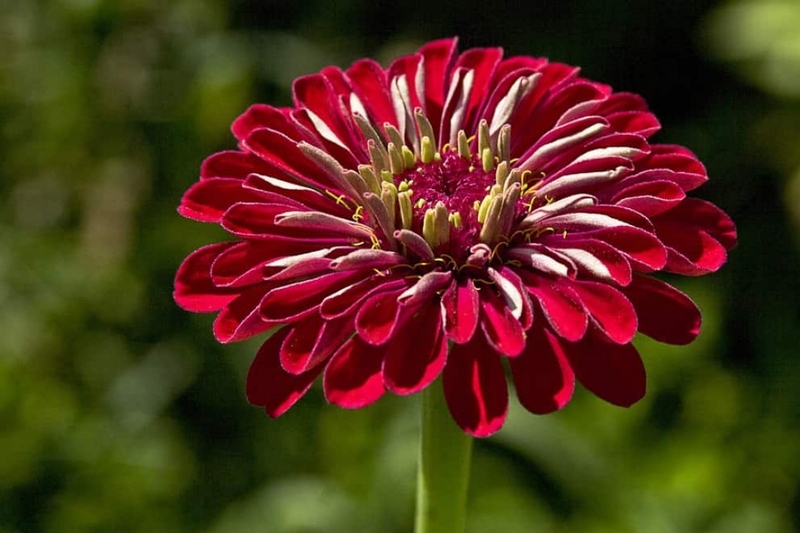 Zinnias grow easily and prefer well-drained, loamy soil and full sun. They grow best in dry, warm, frost-free regions, and many kinds are drought-tolerant. Some may be grown indoors. Starting at the end of April for mild climates — mid-May for more northern regions — choose a sunny space for your plants. Without sun, they won't flower well. Ordinary garden soil is ideal -Additionally, avoid heavy or compact soils, which will hold in moisture, to the detriment of your zinnias. You may sow some varieties in planters, but keep in mind most grow up to a good meter of height ! If you have planted seedlings, watch for emergence, which should take one to two weeks, and keep only one plant every 5 cm. Set as soon as May the plants sown sheltered every 20-30 cm or those bought at the merchant. Find a sunny location in rich, drained soil. Just prepare the soil with a light digging, clawing to break the clumps, and a raking to remove the last clumps away from your planting area. Plant every 20-30 cm, staggered. Water copiously so the soil coats the roots well. If you doubt the richness of your soil, in puting some compost juice or nettle manure diluted 1/10 should do the trick! Zinnias planting takes place at the end of May, or at the beginning of June. Plant every 20-30 cm, staggered. Water copiously so that the soil coats the roots well. If you doubt the richness of your soil, a little compost juice or nettle manure diluted 1/10 should do the trick! Zinnias prefer to have there feet dry, except during their first weeks and in case of very hot weather. Water sowings and seedlings in rain to not uproot them, while being careful not to drown them. Once in open soil, they will fend for themselves. Water only in case of long drought. In pots, once well developed, a gentle watering every 4 days with a water jet or a watering can in the morning or in the evening should be necessary. Shortly after planting, do not hesitate to mulch the base of your zinnias, this will limit the need for watering and the occurence of cracks in the soil. In regions with mild climates — where it doesn't freeze! — your nasturtiums will reseed themselves on their own. Otherwise, let the flowers dry until they're ready to fall, then collect the seeds and allow them to dry for a few days more in the sun. A white felting marks the leaves of your zinnias? It's powdery mildew! It is often due to excess moisture on the foliage : do not water the leaves, this is usually enough to solve the problem. Your zinnias will all fade before the frosts. After flowering, tear them out, to welcome new plants in the fall, gently pulling the plants that must come gently, including roots - or with a spade if that resists!